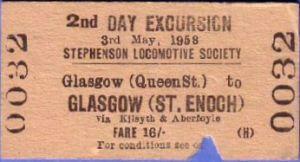 (1) Tour itinerary described this as 'Rail Tour to Kilsyth and Aberfoyle' on the front page and 'Strathendrick Tour' on the route map page. Tour itinerary stated the loco used would be 65316 however the use of 65315, not 65316, is confirmed by various sources. (2) Banked between Queen Street station and Cowlairs (station) by 69182. - St John's - 20c45 ~ 20c46 ? - Cowlairs SB 13/17 20/29 ? 3.19 Bishopbriggs ? ? ?
? Lenzie Jn 13/24 20/22 ? 19.12 Milton of Campsie 14/21 20/10 ?
? Muckcroft No.2 LC 14.25 ~ 14.35 19.56 ~ 20.06 ?
? Alum LC 14.39 ~ 14.49 19.43 ~ 19.53 ? 20.60 Blane Valley Jn ? ? ? 20.75 Lennoxtown 14w55 ~ 15w05 19w30 ~ 19w40 ? 21.70 Campsie Glenn 15/08 19/27 ? 25.14 Strathblane 15/17 19/22 ? 26.10 Blanefield 15.20 ~ 15.30 19.09 ~ 19.19 [LC] ? 29.09 Dumgoyne ? ? ? 30.46 Killearn 15/44 18/58 ? 31.76 Gartness Jn ? ? ? 33.57 Balfron 15.53 ~ 15.58 18/51 ?
? Ballat LC 16.02 ~ 16.12 18.37 ~ 18.47 ?
? Balwill LC 16.17 ~ 16.27 18.22 ~ 18.32 ? 37.70 Bucklyvie 16.30 ~ 16.40 18.09 ~ 18.19 [LC] ? 41.75 Gartmore 16/49 18/00 ?